The winners of the chemistry prize hail from France, Scotland and the Netherlands. (Inside Science) – The 2016 Nobel Prize in Chemistry has been awarded to three chemists "for the design and synthesis of molecular machines." The prize goes jointly to Jean-Pierre Sauvage of the University of Strasbourg in France, Sir J. Fraser Stoddart from Northwestern University in Evanston, Illinois, and Bernard L. Feringa, from the University of Groningen in the Netherlands. Molecular machines are considered the world's tiniest machines. The laureates are recognized for linking molecules together to design everything from tiny elevators to miniature muscles. These minute devices are as much as 1,000 times thinner than a strand of human hair. The award was announced by Goran K. Hansson, secretary general of the Royal Swedish Academy of Sciences. The winners will share a prize of 8.0 million Swedish kronor (about $934,000). Editor's Note: Inside Science will provide detailed coverage of the 2016 Nobel Prize in Chemistry in a longer article to be issued later today. All of our coverage of the 2016 prizes is available here. 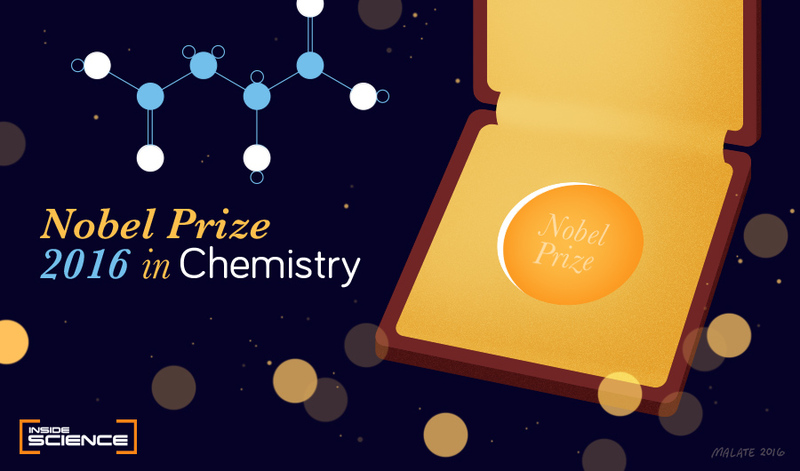 For our coverage of other Nobel Prizes from recent years, please click here.